How much money will Russia make off operations in Syria? The Algerian contract for the Mi-28NEs is estimated at $600-700 million. Russia has spent $464 million on its air force operation in Syria, but it could earn far more from its involvement. Potential export contracts for weapons systems tested in Syria may reach $6-7 billion over the next several years. The more than five-month Russian air force campaign in Syria has cost the country more than 33 billion rubles ($464 million), says Russian President Vladimir Putin. Yet, these costs do not appear excessive given the expected dividends. Several military sources told Dengi business magazine that since the start of the Syrian campaign the Federal Service for Military-Technical Cooperation has been approached by many countries expressing an interest in Russian defense industry equipment, mainly aircraft. “On the one hand, (in Syria) we have demonstrated the capabilities of our military hardware, attracting the attention of potential customers; on the other, more than half of all our pilots have received practical combat experience,” says a source involved in military-technical cooperation with foreign countries. In December 2015, Algeria ordered 12 Su-32 bombers. According to Sergei Smirnov, director of the Novosibirsk-based Chkalov Aircraft Plant, talks about a possible deal with Algeria have been dragging on for eight years. The bomber’s successful performance in Syria has given a new impetus to the negotiations. According to Dengi sources, the first squadron of Su-32s will cost the Algerian military in the range of $500-600 million. A future purchase of a further 6-12 aircraft is possible. At the same time, talks concerning the acquisition of at least 10 Su-35S fighters are expected to begin. A firm contract for this amount of aircraft is estimated to be at about $850-900 million. Another breakthrough is the signing of a deal to supply some 40 Mi-28NE attack helicopters to Algeria. The first batch is ready to be dispatched. These aircraft had already been purchased by Iraq for its fight against the Islamic State. The Algerian contract for the Mi-28NEs is estimated at $600-700 million. Su-35 fighter jets have also stirred interest among customers in Indonesia, Vietnam and Pakistan. Each of these countries has had experience operating Soviet and Russian aircraft, but they want to considerably upgrade their fleets. In the case of Indonesia and Vietnam, contracts worth over $1 billion are being discussed. Indonesia may seek a loan for the deal. In the case of Pakistan, things are a little more complicated. In addition to a grave economic situation, the potential deal is threatened by geopolitical aspects related to neighboring India. Dengi sources say that even in the best-case scenario, Pakistan would not be able to buy more than six aircraft. Yet, even such a small-scale contract is estimated to be in the range of approximately $500 million. The Ka-52 Alligator helicopter has also attracted attention. 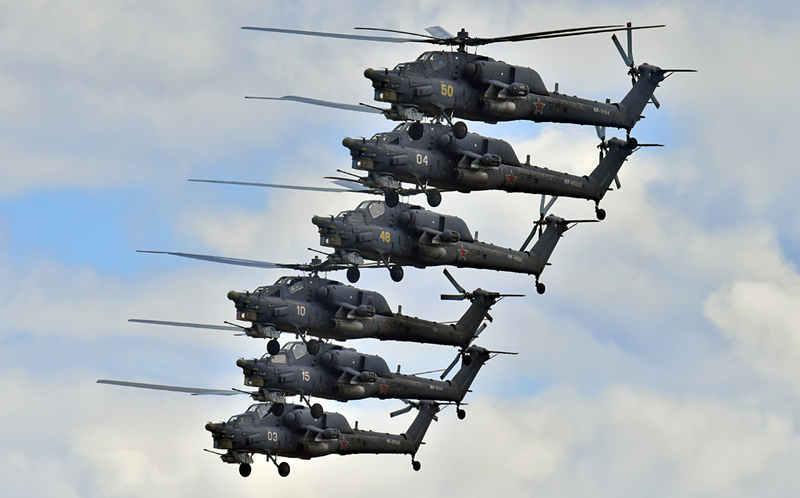 Rosoboronexport, Russia’s state agency for military exports, has signed a contract with Egypt for the supply of 46 helicopters, with deliveries scheduled to start in 2017. It is expected that the demonstration of the Ka-52’s combat characteristics during the operation in Syria will help find new customers for this aircraft, particularly in the Middle East. This example will now be used in negotiations with clients, a senior manager at a defense industry enterprise told Dengi. The list of potential clients for this tank includes Iraq, Iran, other Persian Gulf countries and former Soviet republics. What is the chief threat to Russia’s T-90 tank on the Syrian battlefield? The use of S-400 air defense systems in Syria has boosted interest in this weapon in Saudi Arabia and has served as an impetus for more active talks with India. In either case, the contract may be worth $2-3 billion, depending on the number of missile systems purchased. Contracts should be negotiated straight away considering the current exchange rates, Makienko explains. Given the production cycle, the final settlement of accounts will be carried out no earlier than 2-4 years from now. First published in Russian in Kommersant Dengi.